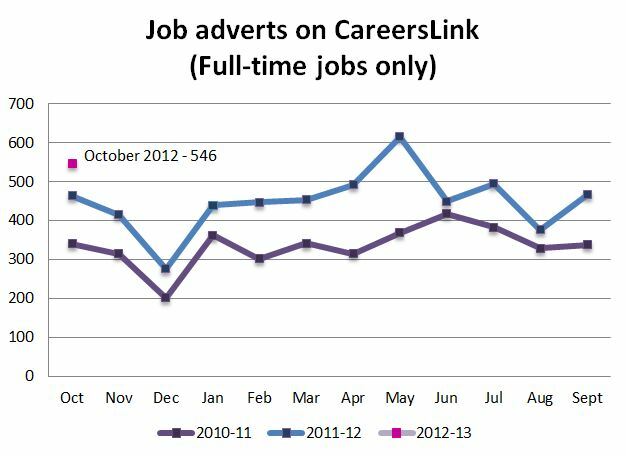 There seems to have been a remarkably high number of ads coming into the Careers Service recently, given the general state of the job market, so I’ve updated my graph showing how many job ads have been advertised month by month on CareersLink (University of Manchester login required). It really does show the improvement in the job market, at least for the kinds of jobs which employers want our students to know about. November’s figures aren’t in yet, obviously, but October showed another increase on last year. One job ad can be for one, or for many, jobs. At this time of year, when large employers announce their new graduate schemes, they may send us one ad per job, or one ad to cover tens or even hundreds of jobs. Later in the year, most job ads are for one or maybe two jobs. Quite a number of big name employers advertised their jobs even earlier than October – you need to go back to September’s ads to see those. These are employers who specifically want to target University of Manchester students and graduates, so it may not reflect the job market in total. The number of ads sent to us always tails off, starting in November, but I’ve been surprised to see that we’ve received over 180 ads just in the last week – there’s still time to apply for jobs for next year. You can also see that there is always a peak of ads around May/June. You don’t find big company “graduate schemes” advertised in the summer (they mostly get filled in the autumn rush ie now). However, smaller employers or those with “one-off” or specialist jobs often only advertised a couple of months before they want to fill the job. They know that there will be a whole new crop of graduates coming on to the job market in June, so that’s when they advertise. If you’re not due to finish your Masters or PhD until October, don’t ignore this glut of jobs in early summer – employers may be perfectly happy to wait for 3 months until you’re available.